SmartCity Living Lab (SCLL), an interdisciplinary research project at the German Research Center for Artificial Intelligence (DFKI GmbH), is developing and testing innovative information and communication technology for the cities of tomorrow. At our Kaiserslautern site, in cooperation with partner institutions, we are researching how modern technology can be deployed sensibly and systematically in cities so that it can contribute in different areas to sustainable urban development. The development of urban living environments is one of the big challenges of the future. In Europe two thirds of the people already live in towns or conurbations. Together with climate protection and sustainable resource management, adjusting to population growth and changing societal needs play a central role. It is essential to create attractive living environments and at the same time promote the competetive capacity of local industry. Given the increasing integration of modern communication technology in all areas of life, data and information have become a significant resource for society and a decisive success factor when considering the development of modern cities. Responsible use and analysis of this data to improve the quality of life is as important as the creation of infrastructures and civic involvement in times of social media and the increasing demand of information and participation. The DFKI has conducted various national and international projects in the context of SmartCity over the last few years. 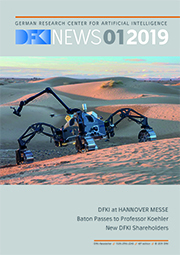 With the newly established SmartCity Living Lab, the German Research Center for Artificial Intelligence (DFKI GmbH) is now bundling its competence from various areas of research and making use of the possibilities of modern and innovative information technologies in an urban environment, by investigating collaborations between science, politics and the public, as well as social and ecological enhancement using intelligent technological solutions. To this end as many interest groups as possible should be included, but the public in particular as users and inspiration in the context of events and urban daily routines as well as forward-looking urban development. The DFKI SmartCity Living Lab is being developed in Kaiserslautern headed by Prof. Dr. Paul Lukowicz (director) and Prof. Dr. Andreas Dengel (deputy director).